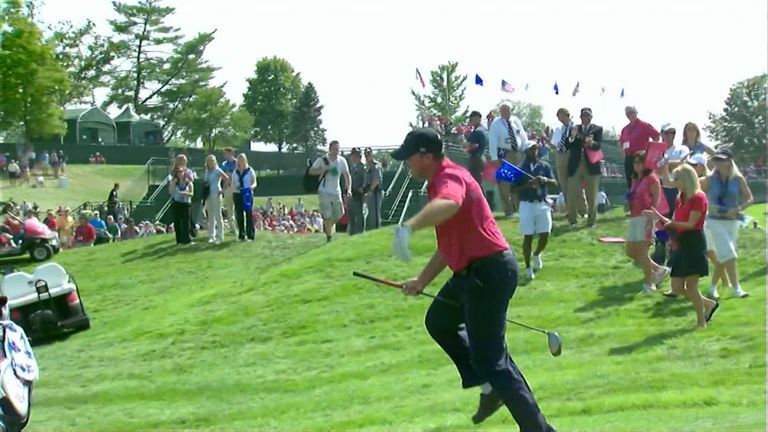 We continue our countdown to the 42nd Ryder Cup by remembering Boo Weekley’s dance down the fairway when representing Team USA at Valhalla. Paul Azinger's side - looking to avoid a fourth straight loss - took a 9-7 lead into the Sunday singles, where Weekley went out to face Oliver Wilson. Weekley showed little signs of nerves as he pounded a drive down the middle of the opening fairway, before channelling his inner Happy Gilmore as he walked to his ball. Weekley would go on and win the match 4&2, helping Team USA to a 16.5-11.5 victory and their first of the 21st century. Just like Gilmore had done in the iconic movie, Weekley pretended his club was an animal and "rode the bull" as he galloped down the fairway. Click on the video above to see Weekley's bull ride! Watch the Ryder Cup live from September 28-30 on Sky Sports' dedicated Ryder Cup channel.